Rivendell works to promote growth physically, emotionally, and intellectually. We understand that there is more to the learning process than memorizing facts and mastering skills. Learning can be an emotional experience for a child. Students need to have opportunities to explore interests, pursue passions, and have the social and emotional support that will help them develop into life-long learners. We believe that when students are encouraged to solve problems creatively, work collaboratively and apply higher order thinking skills to real world problems, they are better prepared to successfully meet future challenges. 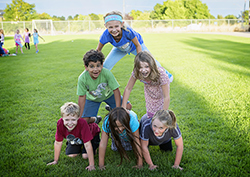 At Rivendell, students learn through music, art, physical education, Spanish, technology and generous unstructured outdoor play time.